A transformation rule explains how the value of field in a message should be transformed to be used in predictive model. Transformation variable is associated with a message and can be defined on any field in the message. Once it is defined, it can be used as any other message field, while defining the model. 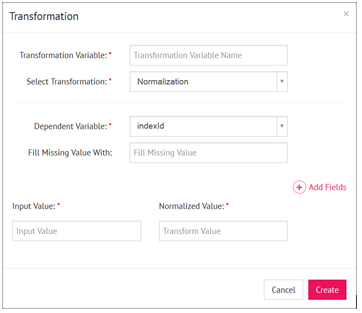 Normalization field is dependent on continuous field. This transformation takes a continuous field in input and transforms it into another continuous value by normalizing the input on a linear scale. For example, If a message M has a continuous field F then a Transformation variable T of type continuous can be created using F of M. The linear scale for transformation can be defined on Transformation screen. This transformation is of categorical type and depends upon a categorical type of field of a message. For example, If a message M has a categorical field F with categories setosa, virginica, versicolor then a transformation variable T of type categorical with categories type1, type2, type 3 can be defined on transformation screen such that, setosa will map to type1, virginica will map to type2 and versicolor will map to type3. This transformation is of categorical type and depends upon a continuous type of field of a message. For example, If a message M has a continuous field F, whose value can be from -infinity to +infinity, then a transformation variable T of type categorical with categories low and high can be defined such that, values of F between -infinity to +1 (including +1) will map to low category of T and values of F between +1(excluding +1) to +infinity will map to high category of T.
This transformation is of continuous type and depends upon a categorical type of field of a message. For example, If a message M has a categorical field F with categories setosa, virginica, versicolor then 3 transformation variables T1, T2, T3 of type continuous will be created that will depend upon F with categories setosa, virginica, versicolor.